Unbiased artificial chemical shift data base (UACSB) is available. 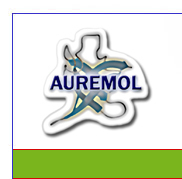 AUREMOL 2.4.2 BETA (Windows) is available for download. Permanent licenses can be obtained from Bruker BioSpin GmbH, License department (license@bruker.de). A new standalone version of the Homology Modeling Software Permol+ (Windows) is available for download. Osapay, Klara; Case, David A. (1991): A new analysis of proton chemical shifts in proteins. In: Journal of the American Chemical Society 113 (25), S. 9436-9444. Han, Beomsoo; Liu, Yifeng; Ginzinger, Simon W.; Wishart, David S. (2011): SHIFTX2: significantly improved protein chemical shift prediction. In: Journal of Biomolecular NMR 50 (1), S. 43-57. Thiruv, B.; Quon, G.; Saldanha, S. A.; Steipe, B. (2005): Nh3D: a reference dataset of non-homologous protein structures. In: BMC structural biology 5, S. 12.